Genoa to Pisa..on south, and oops, back again..
Misty rainy day accompanied me while I rode TRENITALIA, the regional train, to Pisa. The words “trundle” or “plugs along” seem to fit these trains as they lurch along. The conductor hole punched my ticket, all the while leaning on a chair seat for balance. 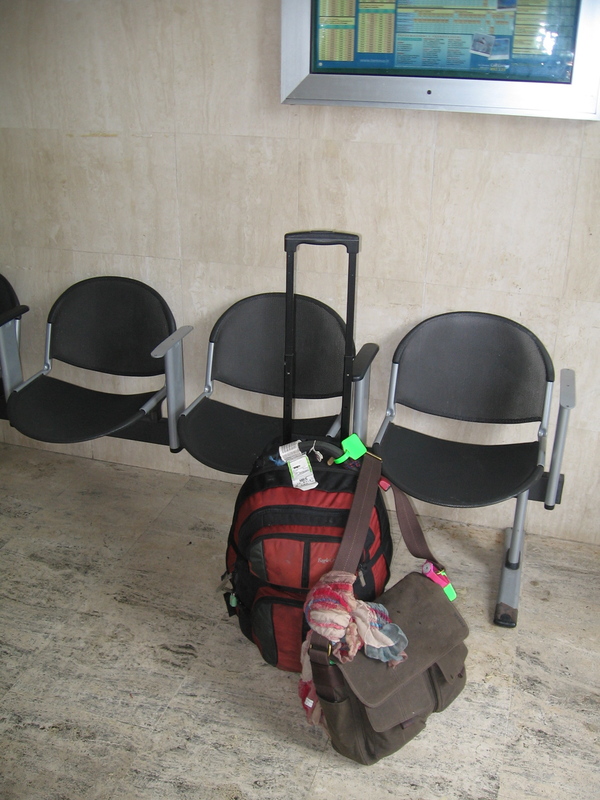 The seats are smaller than the French trains as are the steps to board. God help you if you have a large piece of luggage, because from the station platform to the first step on the train makes you want to discard any unnecessary items and start doing lunges at the gym to build up those thigh muscles for that initial “umph”. There is so much more to this town that just the Tower. One can see the town in a day, but there are museums, churches, a pretty park, great river walk, good restaurants, a 30 minute train ride to Lucca, a one and half hour ride to Florence. 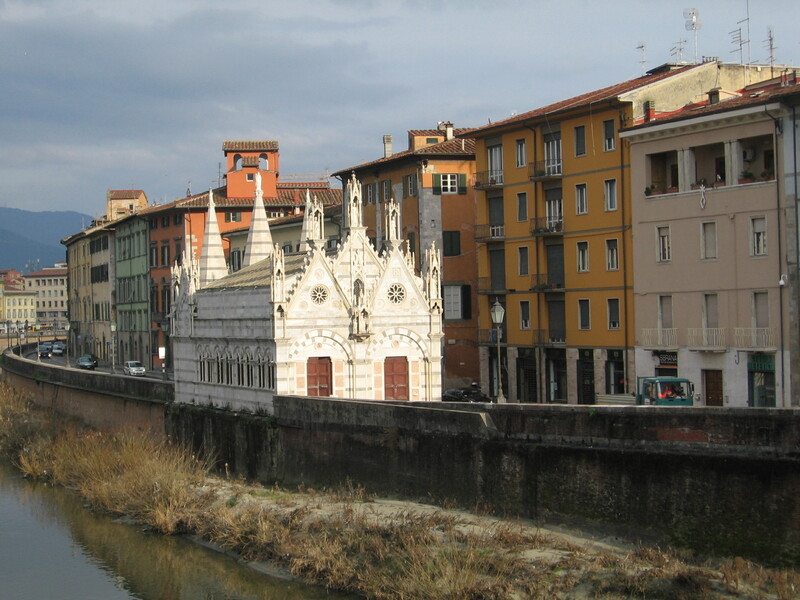 So, Pisa can be a less expensive base to see the surrounding area. I was surprised, because all I have ever heard was “don’t bother” & “not much there”. They had a Miró exhibit in a gallery, also, that I missed! So, it isn’t just the Tower! 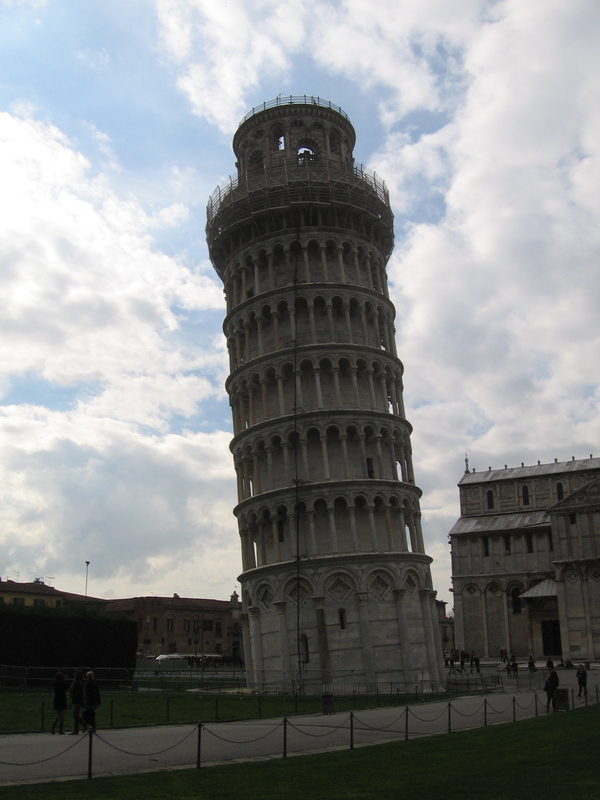 Remember reading about and seeing pictures of the Leaning Tower of Pisa in the 5th grade? I do, and when I saw it, it was a “I truly cannot believe that I am here” moment. Next to the Tower, was a gorgeous cathedral that received little publicity and was spectacular – have to say, it is becoming sort of the norm now – gold leaf, huge paintings, carved statues, marble alters, fresco painted ceilings, mosaic floors and of course, HUGE. The museums and churches filled with relics and religious icons were beautiful, but, the thing that really made Pisa worthwhile was lunch at a 10 table indoor restaurant. My pasta with olive oil and fresh herbs NEVER turned out like that, and the thinly sliced beef with just a smidgen of balsamic vinegar reduction sauce required minimal mastication because it was so tender that it essentially dissolved in my mouth. And, then the desert — semi-orgasmic experience! It was chocolate cake, and of course NO FLOUR, with thinly sliced cooked pears baked on top, drizzled with hot chocolate sauce –just a little to compliment it and not overwhelm it. Fork in hand, cutting off a bit, one feels guilty if this cake is bitten because you might hurt it. But, that decision was already made because as soon as the piece of cake descended upon my tongue — it automatically started to melt, the chocolate and fruit flavor slowly seeped into the roof of the mouth, the flavors started percolating in the most wonderful sense my body had at that moment – taste. All the cathedrals just took a back seat – that was my religious experience. That cake with the cappuccino gave me incentive to always be good for the rest of my life, so I too, could join all those good people in heaven!!! Lordy, Lordy! ok.. back to reality — before I left Pisa, stopped at MacDonalds’s at the train station and had a big MAC — what can I say. And off to a very small village 2 hours south of Pisa … to do a volunteer/work exchange – modern-day indentured servant clad in “culture exchange” – work for food & accommodation – at a German woman’s house. She moved to Italy many years ago and worked at a high-end hotel. German TV on, German friends, German paper — just seem to transfer life from the home country to another place. Would I do the same? And, if so, to what degree? I don’t know. But, another glimpse into ex-pat life abroad. 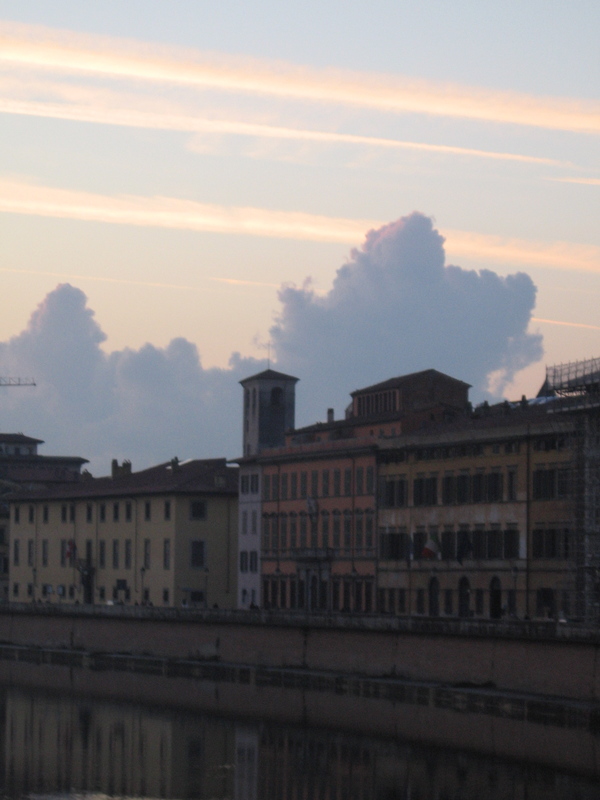 The Exchange didn’t work out for us — it was one of those instances when it was an instantaneous “Nope, this isn’t going to work..” and it didn’t– we live and learn — and life goes on — so — and back to the train station, once again …on the train and push the re-play button back to Pisa! I remember seeing the leaning tower in hundreds of pictures throughout the years, but when you actually see it, you are awestruck! I understand. Dear Lisa – loved this note. My friend who lives in Genoa insisted on taking me to Pisa (and lots of other major/minor sites). I recall that Galileo proved his point (or at least spawned his theory) about gravity while living in Pisa… not to mention his theories about the state of the universe and the earth’s revolution around the sun, etc. etc. Yes, Pisa holds a mark in world history. Of course, the Church had a hard time handling Galileo’s theories, so perhaps it was in Rome where the rumors started about Pisa not being worth a visit. I am not one for conspiracy theory but I agree that Pisa is definitely worth seeing and I would disagree with anyone who thinks otherwise! Looking forward to more of your notes! Wonderful! Photos, writing, story, all. How fun to be “traveling with you” through your words and photos. Lisa, Oh how I miss you and love traveling through your fabulous diaries. Pisa is beautiful and italians are the founders of delicious food. You keep ordering those yummy dishes and relishing every bite. It does not get better than that. Been thinking of you because I visited Tubac and asked about your B&B and if anyone knew you….you have not been forgotten. I was on my way to Organpipe National Monument. Bet your thoughts are in another realm than the desert.